One of the highlights of mid-summer is viewing Angel’s fishing rod in full flower! This plant has an air of distinction and, when in flower, is extremely desirable. The foliage mound of fine, rather reedy stems produce long, arching wands, that carry pendulous pink to purple flowers. These make them look like fishing rods, hence its common name. Growing wild in open grassland in South Africa, this plant is self-supporting and can tolerate wind. 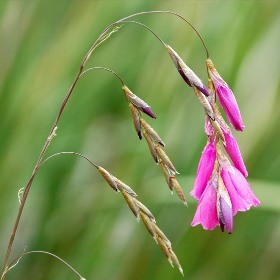 Dierama pulcherrimum is ideally suited to a position near water, in free draining soil, and with space to appreciate its fishing finesse. To get the full benefit of this trouble free plant, grow it in full sun and once established try not to move it as it hates disturbance.